House Clearance Service In Airdrie North Lanarkshire Cleland Croy Dullatur Forrestfield Garrion Bridge Gartcosh Glenboig Glenmavis Greengairs Hareshaw. My uncle passed away a few weeks ago, prior to the sale of his house i need a clearance firm to come in and completely empty everything. All of the furniture is still intact as well as all of the cupboards being completely full (this includes food etc). I have looked through some of the images on your website and would not describe his house as being cluttered, though you may need more than one van load. 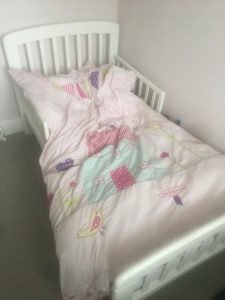 His house is a three bedroom detached with a small garage to the side and is located in Airdrie – North Lanarkshire, please can you provide me with the earliest time you could do this. Thank you in advance, Mary. 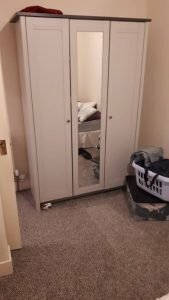 A white solid wood triple wardrobe, having a full size mirror to the middle panel. 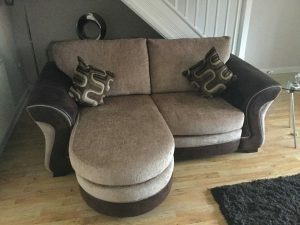 A small three seater left hand corner sofa, upholstered in chocolate brown suede and camel chenille. 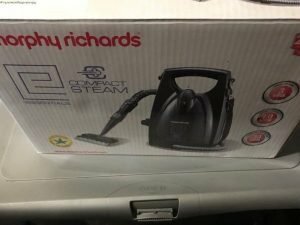 A brand new boxed black Morphy Richards compact steam cleaner. 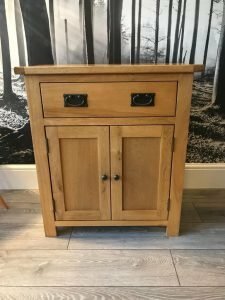 A small solid oak sideboard unit, having a large drawer above a double cupboard. 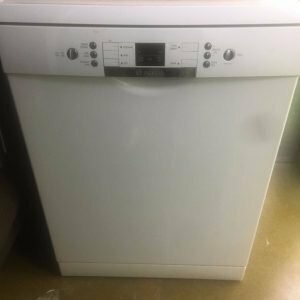 A white Bosch SMS53A12GB full size under counter dishwasher. 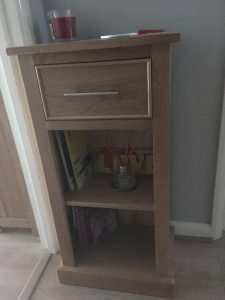 A small solid oak hall unit, having one drawer above two shelves. 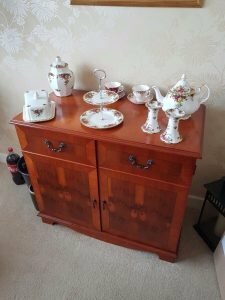 A vintage Yew wood small sideboard, having two drawers above a double cupboard, together with a Royal Albert partial tea set. 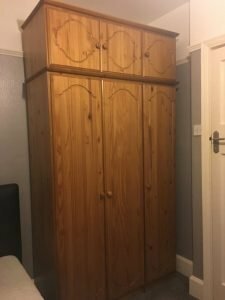 A tall solid pine two piece triple wardrobe, having one double and one single cupboard to the top. 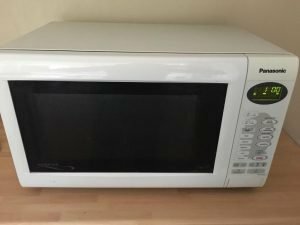 A white Panasonic 600w microwave oven. 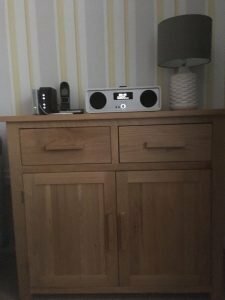 A small solid oak sideboard, having two drawers above a double cupboard, together with a white ceramic table lamp and grey shade. 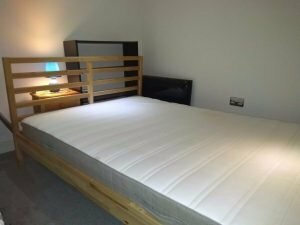 A white solid wood John Lewis Children’s single bed, together with a single mattress. 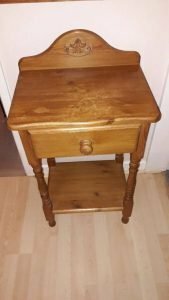 A small solid pine carved telephone table, having one drawer above a shelf. 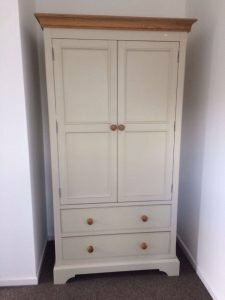 A white solid pine tall standing double wardrobe, having two large drawers to the base. 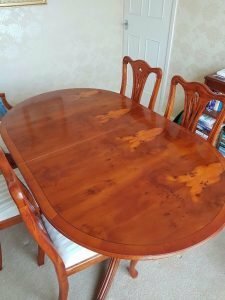 A solid Yew wood vintage extendable dining table, together with four carve dining chairs, upholstered to the seats with satin fabric. 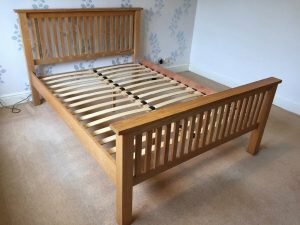 A solid oak laddered king size bed frame, together with a white king size mattress.